Like the shell of a Turtle (Turtle), the protection works in the same way as a biker’s helmet: on the outside, a rigid shell (the dorsal) covering the soft material inside in contact with the body (the airbag). It is a world first for a motorbike airbag, a small revolution for the sector and probably an innovation that will become standard in a few years. The new Turtle airbag generation is a revolution for the motorcycle airbag market, achieving incomparable protection results. The synergy between the rigid back part and the airbag brings a significant gain in the distribution of impact forces; they dissipate over the entire airbag, greatly improving energy absorption and reducing the risk of intrusion. The Turtle Technology resists and protects much better and on a larger surface against local impacts like small pointed, sharp or blunt objects. The airbag protects new areas of the back. Thanks to the positioning of the rigid shell on the outside, the latter acts as the first bulwark by intercepting the obstacle and then distributing the forces over the entire surface of the airbag on which it rests. 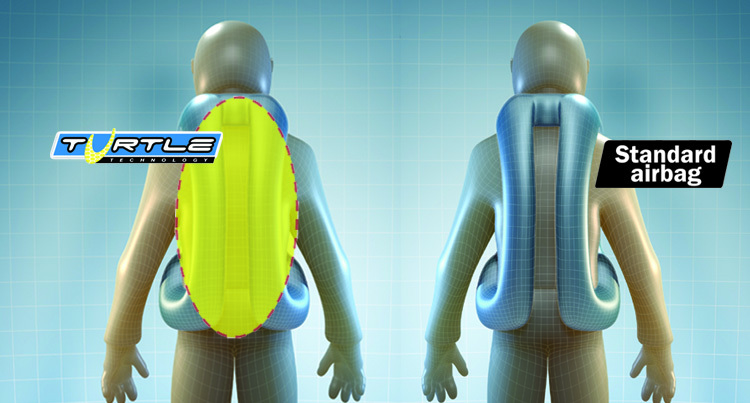 Even if the obstacle hits locally between the two airbag flaps, the airbag will protect, Turtle technology helps to protect a larger surface of the back. In addition, the airbag is protected by the rigid shell and therefore is even less vulnerable to abrasion, intrusion or bursting. The TURTLE sets records impact absorption which go well beyond the criteria required for the certification of an airbag. This synergy between the hard hull and the airbag is remarkably effective during an impact against a sidewalk, a safety slide, a signpost, etc. Thus, the impact of an object of 130 mm diameter (standard object used to certify motorcycle airbags) is 4 times better damped than with a traditional airbag. And the smaller the object, the better the protection going on to exponential proportions.